Meet our Investors Group Walk for Alzheimer's White Rock, North Delta and Surrey Honouree: Gina McCulloch | Alzheimer Society of B.C. When Gina McCulloch came home to find her mother, Anna Baldwin, flailing in her electric recliner after mistaking the chair remote for that of the unresponsive television in front of her, the reality of their situation was undeniable. 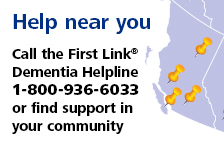 Five years into their journey, Gina connected with the Alzheimer Society of B.C. and found it essential – both for herself and for her mother. Gina attends a support group and attends every caregiver education session offered by the Society. Gina and Anna shared laughs over the episode with the electric chair, but Anna’s loss of independence put serious stress on their relationship – a weight Gina no longer carries on her own. Walk with Gina at the White Rock, North Delta & Surrey Investors Group Walk for Alzheimer's on Sunday, May 6. Together, we make memories matter.